All-in-one keyboard platform with 5 1/2" height range, 360° swivel and +15°/-15° tilt. Adjusts to 1" above mounting surface and 4 1/2" below mounting surface. Easy height and tilt adjustment; just loosen knob, position tray as desired, then re-tighten knob. Standard all-in-one platform with wooden construction minimizes bouncing. Mousing surface can be positioned right or left. Full-width leatherette gel wrist rest with antimicrobial product protection. Precise™ mousing surface extends battery life. Increase comfort and productivity by placing your keyboard and mouse at a proper level. This keyboard has a knob adjust arm that controls both height and tilt—just loosen knob, set height and re-tighten. Adjusts height to 1" above mounting surface and 4 1/2" below mounting surface. Standard all-in-one platform with wooden construction minimizes bouncing. Includes all-in-one leatherette gel wrist rest with antimicrobial product protection and Precise™ Mouse Pad that can be placed on right or left of keyboard. 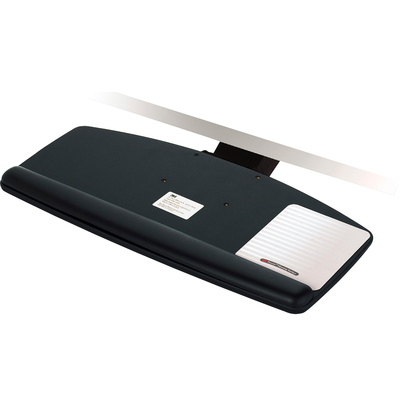 Maximum height above mounting surface: 1"
Maximum depth below mounting surface: 4.5"
Compatible with shallow workstations where mounting depth is greater than 18.25"
Antimicrobial product protection: Gel-filled wrist rests with antimicrobial protection inhibits the growth of microorganisms, such as bacteria, on the product surface, that can cause stains, odors and product degradation.